This solution is ideal for situations where high amounts of magnetic interference is present in the environment such as cars or underground train stations etc. Magnetic interference can be annoying and can possibly prevent the user hearing received instructions. The shoulder pad uses specialised patent pending technology, it utilises audio signal modulation scheme that uses carrier frequencies within the audio band and as a result unlike some other solutions on the market, it avoids the possibility of user detection by keeping the link between accessory to earpiece secure. 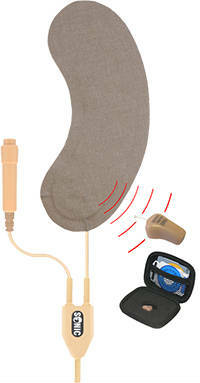 It is used in conjunction with DR5 digital wireless earpiece which is one of the smallest on the market, advanced digital processing techniques make sure the user only hears outstanding speech quality across the whole of speech band, this results in the user experiencing the received signal with Readability 5 on the scale.